This is part three of a three-part running series. Read part one here. Read part two here. During a podcast I was recently listening to, one of the guests stated that research shows that living by water is good for your health. As I looked into this claim I came across a book by Wallace Nichols titled Blue Mind: The Surprising Science That Shows How Being Near, In, On, or Under Water Can Make You Happier, Healthier, More Connected, and Better at What You Do in which he writes, “Water in all its forms can be the quickest shortcut to mindfulness.” As my previous blog posts have noted, running doesn’t come easy for me and one of the things that I have found helps me want to run is running outside, especially when there is a trail along a body of water. When I travel, I take the time to look for outdoor places to run wherever I am headed. I have also come to love the village where I live, in large part because of its proximity to the Mohawk and Hudson Rivers, the beautiful surroundings, and great places to run. I live in Waterford, New York, the oldest continuously incorporated village in the United States, which is where the historic Erie Canal begins and the Hudson and Mohawk Rivers meet. My favorite run takes me over 2 inlets of the Mohawk River and when I run in the morning, the mist on the water is stunning. In the evening, the sunsets over the water and the bridges are lovely. Since I need the motivation to run, I feel lucky that these beautiful sites provide some of that motivation. Perhaps because of what I have in my hometown, whenever I travel, I now seek out places to run that will take me along bodies of water. 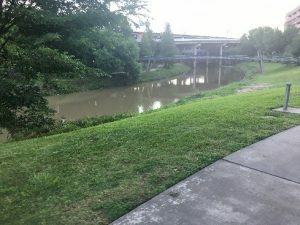 In Houston, Texas I plotted a trail to the Buffalo Bayou. The buffalo are long gone and it is crisscrossed by highways, but it was still lovely. In Austin, the Lady Bird trail along the Colorado River is very pretty, and the long bridge across the Colorado River is impressive (much higher and longer than the bridges in Waterford). In Lansing, Michigan, I ran just as the sun was coming out along the Grand River. In Bismarck, North Dakota, I have run by the Missouri River and in the Dakota Zoo. In San Diego, California, I ran along Quivira Basin, which is fed by the Pacific Ocean. On vacation last summer in Portland, Maine, I ran along Back Cove. In Oklahoma City, Oklahoma I ran along the new canal, which leads to impressive Land Run monument. In Seattle, Washington, I have run along the banks of Portage Bay. 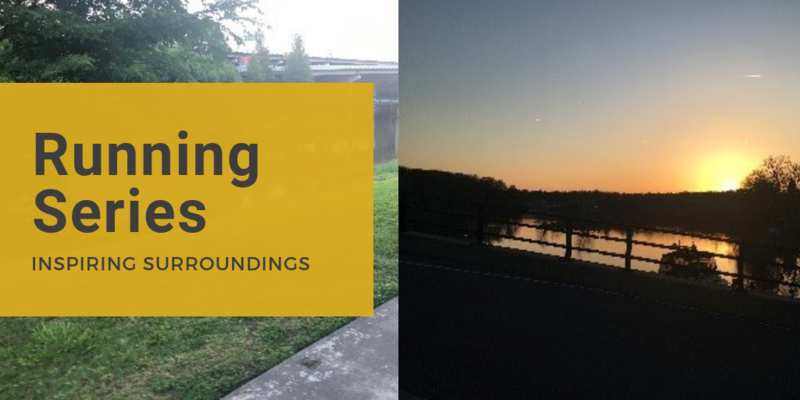 The September Tug Boat Chug 5k held in Waterford goes over one of the Mohawk River inlets and continues on trails on the beautiful Peebles Island, which has amazing views of the Mohawk River and some the Cohoes Falls. 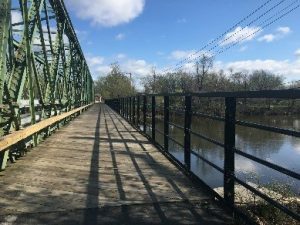 The November Veterans Revolutionary 5k Run in Stillwater, New York takes participants along the old Champlain barge canal at the beginning of the course and on the way back to the finish line. While it’s not quite clear why water has this effect on us, I think the bodies of water do call to me, and I am a now believer that bodies of water are both soothing and inspiring! Why Living Near Water is Good For Your Mind. Putting down roots near a shoreline could help combat depression.